STAR WARS AFICIONADO WEBSITE: AN 'EMPIRE' AT 35: TARGETING THE FALCON! 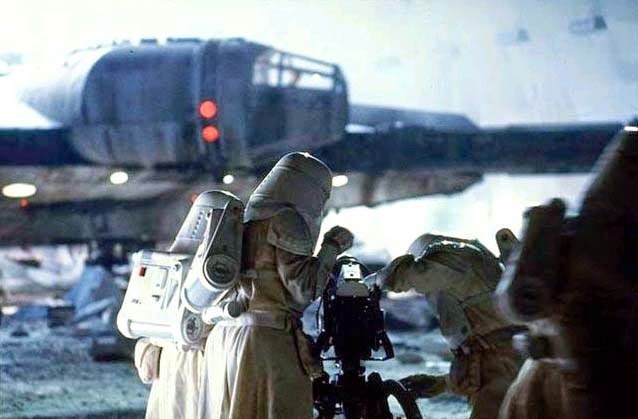 Newly arrived Imperial Snowtroopers prepare their heavy laser cannon for firing at the Millennium Falcon, in a tense moment, and impressive photo composition (note Han in the Falcon cockpit), from THE EMPIRE STRIKES BACK. Looking forward to seeing what new scrapes the specially re-built freighter will get into for EPISODE VII.